“I will cling to Christ as a burr clings to a coat!” With these words, Katie Luther gave up her breath to the Lord. On January 29, 1499, she had been born to an aristocratic family of diminished means and given the name Katharina von Bora. Little is known of her early life, even her place of birth — likely in Meissen or Lippendorf, Germany— except that she had several brothers and possibly a sister. As in other Catholic families, Katharina was baptized shortly after birth, joining her to the body of Christ. At five, her parents enrolled her in the Benedictine school in Brehna, Germany, where her aunt Magdalena was a cloistered nun and where she would have received the best education available for girls of her class. The Benedictines encouraged education, and their schools were noted for their academics. When Katie’s father remarried, he did not bring her back to the family but transferred her as a teenager from Brehna to the Cistercian convent at Nimbschen, bordered by forests and a river with fields, gardens and a pond. Katharina took vows as a nun seven years afterward, possibly upon losing her parents. As the Reformation gathered adherents, it was impossible to be unaware, even within a convent’s walls, of dramatic changes effected by Luther’s words, even during his mysterious disappearance. The nearby monastery of Grimmen closed, vows of celibacy were annulled, and churches were sacked. When Luther returned from hiding, Magdalene von Staupitz wrote to him, pleading that he free nine nuns from the confinement of their cloister; neither guardians nor parents had been willing to receive them. Luther arranged with a city councilman from Torgau for their daring rescue on Easter evening, hidden between the merchant’s herring barrels. The women were settled in new homes through marriage or as housekeepers in wealthy homes. 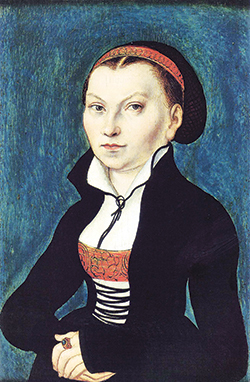 Katie lived for a time in the home of the burgomaster and later with the family of artist Lucas Cranach the Elder, who painted her portrait. She continued studies at the university and wanted to wed fellow student Hieronymus Baumgaertner, but his parents refused permission for him to marry a runaway nun. When all attempts to find her a husband failed, though she had other suitors, she stated that she would only consider Luther. Her marriage was a happy one. 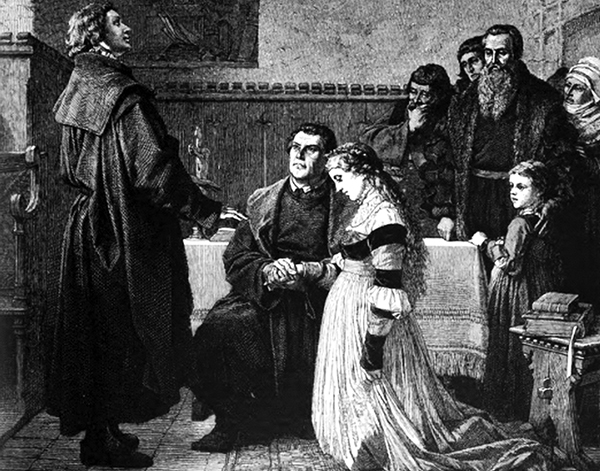 Luther praised her highly, even referring to St. Paul’s Letter to the Galatians as ‘My Katharina von Bora.’ She was not a meek woman who lived in Luther’s shadow, but a strong partner. She and Luther argued, like all couples — often about money, for she was practical and he was generous — but she was equal to his wit. Her faith was tested in the crucible of suffering as well. She miscarried during her first pregnancy; another child died at eight months. Luther once became dangerously ill. Certain that he would die, he commended her, together with their babe in arms, to the God of widows and orphans and His gracious will, yet she comforted him with Scriptures and prayers, and he recovered. He was often sick, at times suffering from gout, insomnia, catarrh, hemorrhoids, constipation, stones and dizziness, and she expertly prepared herbal remedies and poultices. Four of their children reached adulthood, all remaining faithful to Christ. Hans studied law; Martin Jr., theology; Paul became a doctor; and Margarete married a Prussian nobleman. Luther’s life was often under threat. In addition to sickness, especially in later life, he had many political enemies. After Katie begged him not to attend the wedding of his friend Spalatin, he fortunately agreed and was spared assassination. Even in his last illness, he was away from home. Katie couldn’t be at his bedside, and learned of his passing shortly after receiving his letter saying he would soon return home. Although Luther left her his estate, she failed to take his advice to sell it, and it was lost to war and taxes. Facing poverty, she had to rely on the generosity of Luther’s supporters. This extraordinary woman inspires us, for life is a long, unforeseen way for each of us. It is a way of the Cross, yet a way of blessing. Scripture tells us: “Blessed is the one who remains steadfast under trial, for when he has stood the test he will receive the crown of life, which God has promised to those who love him” (James 1:12). Through adversity and need, acquainted with joys, tragedy, and grief, Katie exhibited deep trust in Christ as her strength. As the burr clings to the cloth, she clung to Him; but as the cloth entangles the burr, He held her firm to Himself — just as He will hold each of us who put our faith in Him.